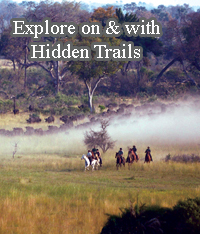 Welcome to the Hidden Trails equestrian and outdoor vacation website. The extensive site with many trip details, in combination with the experienced staff at the office, will help you to find the best trip possible. We are all nature enthusiasts who love horses and outdoor adventure activities. Horseback riding and other outdoor adventure activities have been our business for over 20 years. We listen to you and make sure that you select the best vacation for your riding or fitness level. With our partner companies in Germany, Switzerland and France we have collected the best horseback riding and outdoor adventure destinations all over the world in some hidden places we would like to share with you. These horseback riding holidays are about cantering through forests, galloping on endless beaches, forging rivers, trotting along age-old trails, gazing at beautiful vistas and encountering foreign cultures. Our outdoor activity holidays will take you on foot, by bike, on kayaks or canoes on awe-inspiring adventures or take you on a leisurely walks or cycling tours through Europe. But most of all, these trips are about getting away from the cycle of too much work and never enough free time. Escape from the rituals, which long ago froze our nights and days into little more than routine and away from the worries of our new tense times. It is so satisfying when we take the plunge of adventure - it's unfortunate that we invent so many reasons to put aside living our dreams of adventure. It is sometimes a tangled web that we weave through life. Some of the threads reveal a work-a-day world of commitments, duties and obligations. Other threads are of a quiet fabric of hope, responsibility and refreshment. On our adventures you see the real country, its back country and meet the locals. The love for horses and the outdoors has no boundaries but possesses a common language we all speak and understand. The majority of the overseas rides are from inn to inn, some from castle to castle and a few are camping rides. You will experience new countries and their customs and make new friends. The trips are the best you can find. They have been tested by our staff or associates and received our stamp of approval. If you are considering a special riding or outdoor vacation anywhere in the world, call us first and let our experienced consultants match the perfect trip with your dream. We will listen to you and give you objective advice to help you choose the best destination and adventure. Your vacation is the most precious time of the year and we are committed to making it the most memorable time of your life.